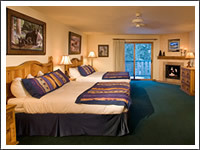 Alpine Village Suites offers 26 beautifully-appointed unique room choices - each one allowing guests to experience the luxury and ambiance of an intimate lodge setting in a truly unmatched location - with truly unmatched services and amenities. 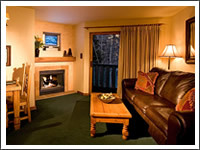 With rooms accommodating two to six people, Alpine Village Suites offers exquisite lodging choices for everyone - from a couple seeking a cozy mountain "room with a view" in one of our Queen or King Suites, to families looking for a luxurious Two Bedroom Suite that will exceed all expectations in terms of both size and style. For larger groups, rooms can be adjoined - making Alpine Village Suites the perfect mountain retreat to accommodate both your need for space, and your desire for luxury lodging. In addition to being beautifully furnished in true ski-lodge style, all rooms have fully-equipped kitchenette, DirectTV with DVD players, full baths and phones. In addition, most rooms have the added luxuries of plush down comforters and pillows, gas log fireplaces, wireless Internet access and private balconies with breathtaking views. With rooms accommodating two to six people, Alpine Village Suites offers exquisite lodging choices for everyone - from a couple seeking a cozy mountain "room with a view" in one of our Queen or King Suites, to families looking for a luxurious Two Bedroom Suite that will exceed all expectations in terms of both size and style. For larger groups, rooms can be adjoined - making Alpine Village Suites the perfect mountain retreat to accommodate both your need for space, and your desire for luxury lodging. The warm and cozy Southwestern décor of our beautiful Queen suites is only part of the appeal of these exquisite suites. With its sprawling King sized bed and cozy down comforter and pillows, our King Suites offer spacious luxury lodging – and the perfect setting to relax and re-charge in after an exhilarating day on the slopes. For added luxury and privacy, our one bedroom units offer elegant suite accommodations with a separate bedroom and warm, inviting living and dining areas.